The lowering of brows that often comes with age results in a tired, angry, or older appearance. Excess skin over the eyelids accompanies brow droop making you look different than you feel. Your friends might repeatedly ask you if you are tired. The goal of a browlift is to restore the brow to a more youthful position. While removing the excess skin from the upper lids can help, it may not fully bring the face into balance. Dr. Ricciardelli uses a variety of surgical and non-surgical techniques to lift the brow. 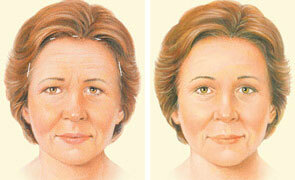 For a slight lift Botox or Xeomin can make a dramatic difference. Ultherapy (tab) is also a great non-invasive treatment to lift the brow area. These non-invasive procedures are performed in the office and can take only a few minutes. For a more permanent solution, Dr. Ricciardelli may recommend a surgical approach. Dr. Ricciardelli is often able to achieve excellent results with injectables like Botox and Dermal fillers. Learn more about Non-surgical browlift options. 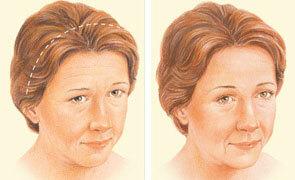 A forehead lift is most commonly performed in the 40-60 age range to minimize the visible effects of aging. However, it can also help people of any age who have developed furrows or frown lines due to stress or muscle activity. Individuals with inherited conditions, such as a low, heavy brow or furrowed lines above the nose can achieve a more alert and refreshed look with this procedure. Forehead lift is often performed in conjunction with a facelift to provide a smoother overall look to the face. Eyelid surgery (blepharoplasty) may also be performed at the same time as a forehead lift, especially if a patient has significant skin overhang in the upper eyelids. Sometimes, patients who believe they need upper-eyelid surgery find that a forehead lift better meets their surgical goals. Is a browlift for me? If you have a low, drooping brow and excess skin in your upper lid area, you may be an excellent candidate for a browlift. If you are a candidate, Dr. Ricciardelli may recommend fillers, Ultherapy, Botox, Xeomen or a combination these easy non-invasive procedures. All of your options will be discussed in depth during your cosmetic consultation. Yes. This surgery is often combined with a blepharoplasty (eyelid lift), liposuction in the neck, chin augmentation, facelift, mini-facelift and dermal fillers. Take advantage lower pricing and time spent away from work by combining procedures. Ask Dr. Ricciardelli about other procedures during your consultation. At your consultation, Dr. Ricciardelli will discuss your medical history and examine your brow and eye area to determine the distribution of excess skin, muscle decent, and volume loss. 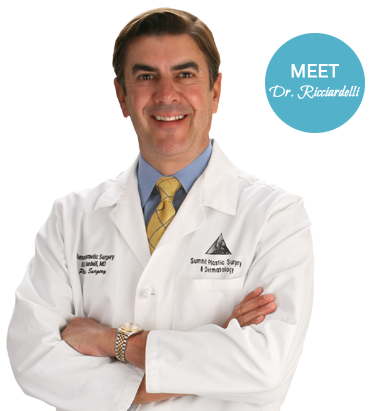 Dr. Ricciardelli’s experience and training will make a difference in this very important aspect of your surgery. These details are important because you want to look like yourself but rejuvenated and refreshed. Most patients find that an endoscopic browlift or a direct lift provide the best results with minimal incisions and the fastest recovery. But every patient is different and Dr. Ricciardelli will discuss the advantages of each approach being mindful to make the smallest incision possible while giving you the result you desire. What can I expect during and after browlift surgery? Your privacy and safety are very important to us. On the day of your surgery you will park in a designated, convenience space in back of the Summit building close to the private back door entrance of our office. Your surgery will most likely take one to two hours in our AAAASF (Association for Accreditation of Ambulatory Surgery Facilities) certified operating suite. After the procedure, you will wake up in our warm and caring recovery suite. Our recovery nurse will make sure that you are comfortable and inform your designated driver when you are ready to return to the comfort of your own home that day. You will be given detailed instructions for your specific needs. Most patients do not complain of pain after surgery but a mild discomfort. On average, most patients are able to return to work in 7 days and begin light exercising in 2 weeks. A lot will depend on your level of activity at work. You will be seen back in the office after surgery. Expect to have possible bruising, swelling and tenderness in the surgical area. Dr. Ricciardelli will call you in the evening to check-in on your progress as well as see you back in the office for your post-operative visits. Our door is always open for any questions.